Russia’s new nuclear-capable missile suffered another failed test launch, the defence ministry said Thursday, solving the mystery of a spectacular plume of white light that appeared over Norway. The Bulava missile was test-fired from the submarine Dmitry Donskoi in the White Sea early Wednesday but failed at the third stage, the defence ministry said in a statement. The pre-dawn morning launch coincided with the appearance of an extraordinary light over northern Norway that captivated observers. Images of the light that appeared in the sky above the Norwegian city of Tromso and elsewhere prompted explanations ranging from a meteor, northern lights, a failed missile or even a UFO. Describing the latest failure of the Bulava as a major embarrassment for the military, leading Russian defence analyst Pavel Felgenhauer said the images were consistent with a missile failure. “Such lights and clouds appear from time to time when a missile fails in the upper layers of the atmosphere and have been reported before,” he told AFP. “At least this failed test made some nice fireworks for the Norwegians,” he joked. So it seems, given this embarrassing admission from the Russian government, along with an application of Occam’s Razor, that the most likely explanation is a failed missile launch. Is it proof positive that the strange lights were not alien visitors, a meteor, or a black hole? No – but then you cannot prove a negative in this context, and to argue otherwise is to make a classic argument from ignorance. We must argue based upon what we do know and have evidence for, otherwise we could just as easily argue that leprechauns from my garden made the lights as opposed to aliens. Once the standard of “evidence” sinks to such a low level & sloppy reasoning, anything goes. Now will this prevent more wild speculation on the part of UFO-ologists and other wooish true-believers in alien visitation that the Russia-Norway event was likely just something mundane like a missile launch? Probably not. More likely is that many of them will claim that there is some kind of conspiracy to cover up “the truth” (which, of course, only they are privy to) – in this sense, I think it is also likely that an event such as this could easily become the Russian equivalent of the infamous Roswell Incident. And if you know anything about the Roswell Incident and its associated silliness, you know that the woos don’t let anything as pesky as the facts & sound reasoning get in the way of a good story. This entry was posted on December 11, 2009 at 2:48 am	and is filed under aliens & UFOs. Tagged: alien, aliens, argument from ignorance, black hole, Bulava, conspiracy, Dmitry Donskoi, missile, Norway, Norway spiral, Roswell, Roswell Incident, Russia, ship, spacecraft, spaceship, spiral, submarine, Tromso, UFO, UFOlogy, ufoology, visitors. You can follow any responses to this entry through the RSS 2.0 feed. You can leave a response, or trackback from your own site. Norwegian newspapers had a picture of the bulletin from Russian Navy. Ruskies gave info on the location and time of a resticted area on the sea before the strange light in the sky appeared. 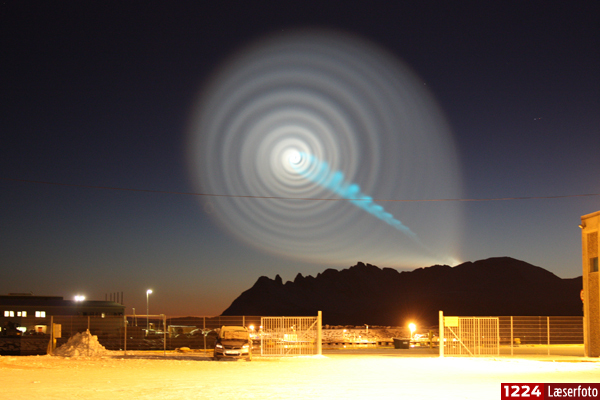 A Finnish tinfoil informed me that the bizarre spiral was, infact, a test for Project Bluebeam.